Soaker tubs, or Jacuzzis, employ multiple pressure jets that discharge a combination of water and air. The tubs can fit in bathrooms or other areas as determined by the homeowner. 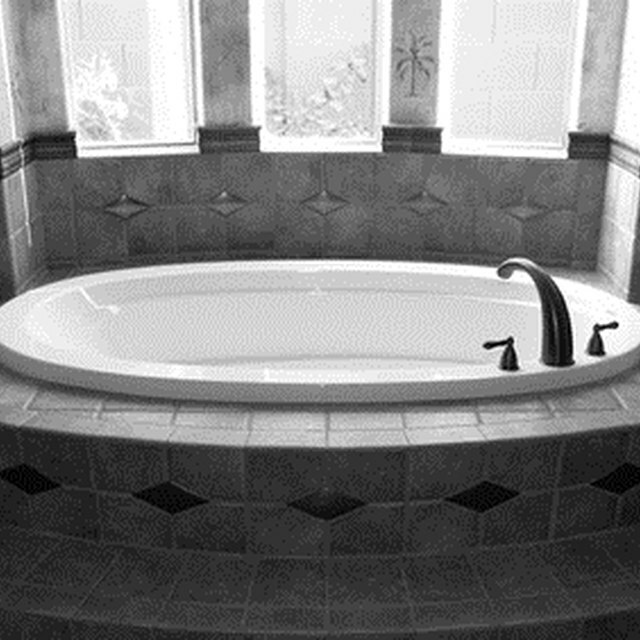 While installation methods require more work than installing a regular tub, the benefits include comfort and relaxation for the owner. Many Jaccuzi tubs can hold two or more people. Inspect the floor of the area where you will install the tub, ensuring that the dimension of the soaker tub fit the layout. Make sure the sub-floor material consists of ¾-inch plywood, level and free of damage. Investigate weak areas to ensure the supporting floor joists are in good condition. Repair the floor as necessary. Apply a layer of mortar if recommended by the manufacturer. Determine if you have a left-hand or right-hand designation. Follow the manufacturer's guidelines for building the tub's frame. Make the opening of the structure one inch smaller than the outside dimensions of the tub. Make sure the tub rests on the sub-floor for the proper support. Frame the walls surrounding the tub with 2-inch-by-4-inch or 2-inch-by-6-inch lumber . Determine the dimensions -- height and width -- for the wall sections surrounding the tub. Cut two pieces of 2-inch-by-4-inch lumber the length of the wall section. These pieces make up the top and bottom plates for the wall section. Put the two piece together, turn on the edges and mark off 16 inches "on center" starting from one end. Mark a line 3/4 inch on each side of the 16-inch marks. Count the number of 16-inch marks and add two. Cut this number of 2-inch-by-4-inch "studs" or vertical boards. Make the length of the studs 3 inches (minus the thickness of the top and bottom plates) less than the total height of the wall. Pre-drill the two nail holes through the top and bottom plates into the studs; secure the end studs in place with 16 penny nails. Place the remaining studs between the 3/4-inch guide marks on the top and bottom plates, pre-drill the holes and nail the boards in place. Repeat these steps for each section, adjusting dimension as required. Install the ground fault circuit interrupter (GFCI) beneath the upper frame as instructed. This device ensures the electrical power automatically shuts off if the tub springs a leak. Some installation may require a second GFCI if the tub has a heater. Arrange the position of the tub so that you can have access to the tub's removable panel to make repairs or replace parts. Place the access in the wall or in the ceiling of the floor below the components. Fasten the flange of the tub to the wooden structure. The flange consists of the lip around the upper portion of the tub. Use the carpenter's level to check that it's level. Slope the tub as required for adequate drainage. Use wood shim in low areas. Secure anchor straps to the wall studs or floor. The straps stabilize the tub and minimize vibrations. Make the electrical and plumbing connections. Add the tub's trim and seal gaps with 100-percent silicone caulk to prevent moisture infiltration. Building codes vary from state to state and within states. Some regulations may require a licensed plumber or electrician perform some aspects of the installation. Obtain the building permit, if required, before proceeding with the project.